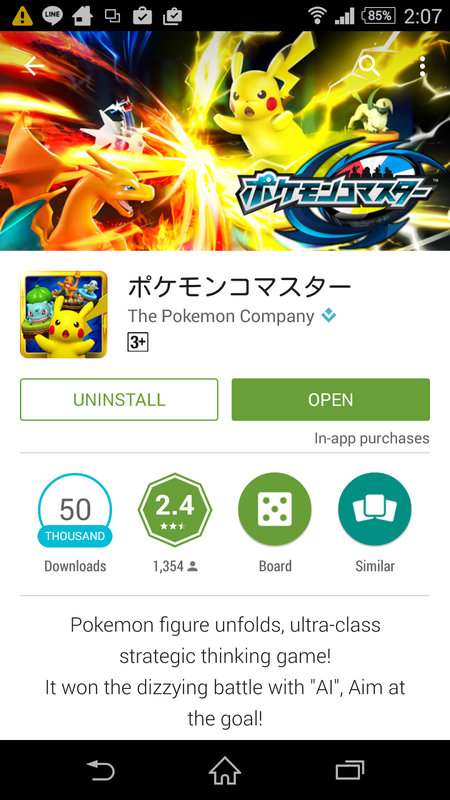 So the Pokemon Company released a new spinoff Pokemon game in Japan. It's a board style game where the goal is to reach your opponent's goal. The board itself looks fairly simple, but as I've played it, I've noticed it can actually be quite a complex game that's interesting to play. Pokemon Co-Master! Because it would be lonely at the top? I was able to download a copy of the game and try it out. However, the game itself is fully Japanese so I tend to act like former 5 year-old self and skip past dialogue and rules. I simply guess the effects and remember what I see. In the process, I've learned a few things but still confused on a few others. As a result, I cannot give a full review, but I'll get as close as I can for the bit I've played. Reading through some comments on Polygon, this is apparently a video game version of some board game that came out quite some time ago but was short-lived. I actually like the board game. It's an interesting twist on the Pokemon formula as every Pokemon is useful, unlike in Pokemon Shuffle. By useful, I mean, you might want to hold on to your starter set and weak Pokemon, because they can be quite powerful. Yes, little Weedle can hold its own against a Charizard, probably. That's how awesome it is. Spearow is also perhaps the deadliest foe in the game where I'm at. So here's game setup: You can have 6 Pokemon figures and you take turns placing or moving them across the board. Each side has 2 spawn points. If your figure gets defeated in battle, it gets sent to the Pokemon Center. If 3 Pokemon are sent there, the one that's been in there the longest gets sent back to your hand, allowing you to place it again after 1 turn. For Battling, both sides spin a roulette wheel for their respective figures. The higher number wins, but it's not always that simple. There are effects which trump attacks. For example, Pikachu can spin a 100, but it's useless if Chespin guards. If the numbers are the same, nothing happens. Taurus' special ability can force its opponent to move back 2 spaces and have to wait 2 turns. This would also beat out Pikachu's 100 spin. On the flip side, if your special has more stars than the other figure's, then your special takes priority. So what do I mean about Weedle defeating a Charizard? This is because if a Pokemon lands on a Miss, then Weedle only needs to land on a 10 and it will defeat its opponent. Each roulette wheel is specific to a Pokemon species so the value of Miss differs greatly. There are at least 2 Pokemon I've gotten where Miss is like 4% while others has it at like 60%. There's another thing that needs consideration when building your team: Movement Points. The highest I've seen is 3 and those are for the weaker Pokemon. The stronger your Pokemon, the more likely it'll be a 2 or 1. If you have all 1's, then you might lose to a team of all 3's. Now just because there are roulette wheels doesn't mean this isn't a thinking game. Luck certainly has it's place in the game, but you definitely need to plan your actions. I've made a few silly mistakes that certainly cost me the match. However, if you are uncertain what to do, just tap the AI button. That's right, you have an AI partner. If you tap it, then the AI will move for you. So far it's done a fairly god job and I've learned some neat tactics from it. However, I have seen a few moves that I think made no sense or were highly risky. I tend to use it when I see 2 valid moves but unsure which to choose. The benefit is that the AI tends to select one of those 2 rather than a 3rd. I also use it when I don't want to bother looking at every figure's roulette wheel in order to figure out which Pokemon to send out. There is one thing I have noticed that the AI never does and that's play your "plates". These cards grant bonuses for your team. For example, I can increase attack power of Torchic by 20, cure a poisoned figure, etc.. Some cards end your turn as soon as you play while others allow for movement as well. Both have their places as sometimes you need to move, but it would cost you the game if you did move a figure. Sometimes the best thing to do is force your opponent to attack first. Getting interested? How do you obtain new figures? The 2 ways I've seen so far is win a match or "purchase" one. Both are difficult as the match option has you spin another wheel with the odds not in your favor. The shop option requires either golden tickets or diamonds, the latter of which can be purchased with real money. The result is that it's difficult to get free figures, but I have managed to get quite a few with quite a bit of patience. There are some duels where the odds of getting a figure is a bit higher and sometimes you can win within 2 moves, so it's possible to collect the figures. There are also matches where you are guaranteed a good prize when you win the first time, like diamonds or a Pikachu figure, in addition to the roulette wheel spin. It is possible that you just keep getting stuck with obtaining the same figure again and again. Those figures can still be put to good use. If you fuze them with another Pokemon, the base figure gains a lot more experience than you get from winning a battle. After leveling up, you can deplete the Miss sections and increase the odds of landing on something you want. It's a slow process, but the results can make your figure better than another of the same model. You can also play online against other players in ranked battles. To do this, you first need to obtain special tickets by playing the campaign mode. When you go to play, there's ranked mode and room mode. I assume room mode is to play against nearby opponents. In ranked mode, you have a chess clock where your time goes down during your turn. This adds a sense of urgency to every action as you want to make sure you have more time on the clock than your opponent. It also forces you to try and plan your move while your opponent is making his. If you have doubts that you are playing against a human due to the AI nature of the game, my doubts were resolved when my opponent stopped playing as soon as it was guaranteed that I had won. Luckily, if your opponent doesn't move for 1 minute, then you are declared the winner. I could see a desire for the time to be 30 seconds, but sometimes it really does take more than 30 seconds to figure a good strategy. Something I find weird, which might be on Google's side, is how the game is rated for 3+. Does that mean they expect 3 year-olds to play this game? That's pretty bad considering that most of the text is kanji and there are quite a few currencies, making this a money trap for those who aren't careful. In summary, I'm so far enjoying this free to start game. The progress can be slow, but it is fun when you have a good match. It's a nice strategy game with good replay value and I could see them using this as a means of reintroducing the board game. Perhaps they can use all of those Pokemon Rumble figures that didn't become a hit. I do have one last warning and that is this app does drain the battery pretty fast, even as fast as you are charging. So you might want to limit playing when you don't have access to a charging station. P.S. The app does crash occasionally. I haven't seen too many, but I have gotten a few. The good thing is it looks like the app handles it nicely so I didn't lose anything. Hopefully it doesn't get worse as I progress towards the end. I'm still only at the 2nd tower.